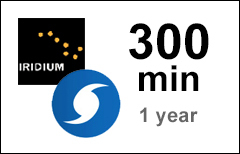 Iridium Emergency 300-min airtime voucher can be applied to your existing Iridium prepaid account (SIM-card). Before applying the Emergency voucher on your existing Iridium prepaid account, your current prepaid plan will be deactivated and all unused minutes and validity time will be forfeited. By purchasing and applying this voucher you confirm that you have read and accepted this condition. If you want to keep unused minutes on your existing plan and would still like to have an Emergency plan, you should purchase a new Emergency Plan and use both plans separately. Upon expiration or depletion of the minutes, your account can be reactivated with another Emergency voucher or can be converted to other Iridium prepaid plans. You can purchase this voucher only if you have an existing Iridium prepaid account activated by Sattrans. Otherwise you can purchase a new plan in Iridium Prepaid Plans.